So sweet! My name is Eli and I was found in the woods and rescued by a concerned citizen when I was a little kitten. I have been vetted and home fostered and love to be held and have my ears and chin rubbed. Born in May 2016, I am looking for my new Best Friend Forever. Might that be you?? 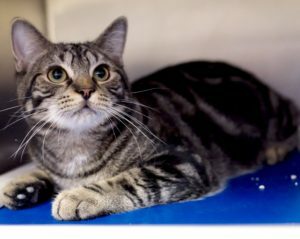 This entry was posted in 6 to 12 Months, Adopted, Adopted Cats, Cats, Male, News, Petco - Syosset. Bookmark the permalink.